Washroom hygiene standards create a lasting impression for your customers, visitors, and employees. The experience they have when using your washroom facilities influences their perception of your business, and how much you care about them. Our hygiene services are dependable, friendly and discreet. We make the process easy for you with intelligent ordering systems to track and replace stock levels, and advising on the correct type, quantity and location of consumables. 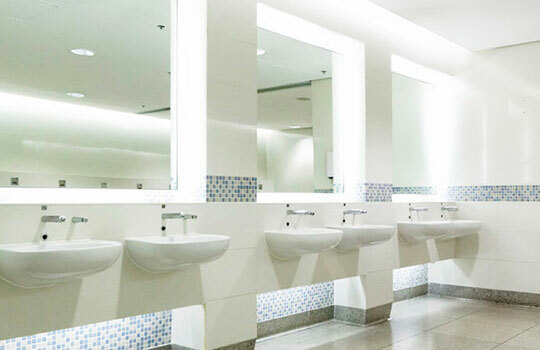 Our well-trained cleaning personnel ensure your washrooms are kept clean and hygienic with the minimum of fuss and without disruption to your core business. We can also provide educational materials for shoppers and staff on good hygiene. Whatever your cleaning or hygiene needs, we’re here to help. Together with regular cleaning services, having the right bathroom accessories and products can make a real difference to your business. That’s where we can help. © 2019 Connect Cleaning Group Pty Ltd. All Rights Reserved.